It’s a long way down. The view from a skyscraper is one thing, but standing in the observation deck of the Gateway Arch, you look straight down and see nothing between you and the grass lawn, 60 stories below. The Arch soars into the air, symbolizing Thomas Jefferson's vision of an “empire for liberty” spreading out from this gateway to the West. But this view would make even Jefferson a little dizzy. 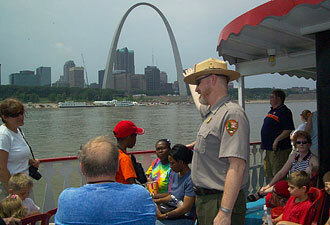 St. Louis was a village perched on the frontier when Jefferson imagined the nation's future. The city grew as it supplied the growing nation. Today this green space in the city's heart marks St. Louis' historic role. Curving paths in the landscape echo Eero Saarinen's modernist landmark, completed in 1965. Downtown workers stroll the grounds on their lunch hours, and families picnic by the ponds. You can rent a bicycle to pedal along the riverfront trail or cruise the Mississippi on a riverboat with a park ranger as your guide. By 2015, a grand new plan to revitalize St. Louis' downtown will transform the area around the park with new activities and attractions. From any angle, the Arch stands as a reminder of human ambition, whether it be Jefferson's, Saarinen's, or the daring 19th-century individuals who built a nation day by day. 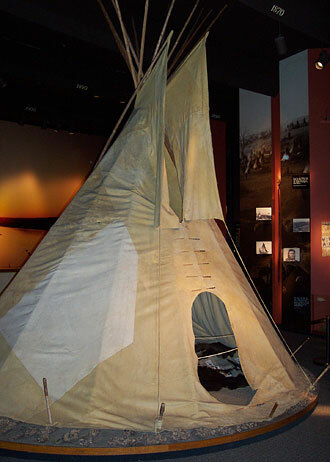 Their stories are told in the Museum of Westward Expansion, in the underground Visitor Center beneath the Arch. The displays show footwear and firearms of explorers, cowboys, farmers and hunters. You'll see the animals they rode and hunted and the vehicles they steered across the plains. Retrace the journey of Lewis, Clark, and company in their own words. Emerging from below ground, you'll find the massive, neo-classical dome of the Old Courthouse Museum silhouetted against the western sky. 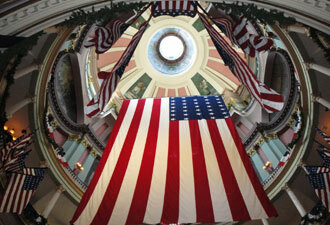 Inside, the grand rotunda has been restored to its pastel colors and gilt details. Stand in the center and hear your voice rise up four stories, like the 19th-century orators who spoke here. As you cross the original flagstones, you're following the 1840s footsteps of Dred and Harriet Scott. Among the hundreds of people who sued for freedom from slavery in this building, this couple saw their case rise to the Supreme Court. The Court's decision—that the Scotts had no rights as citizens—brought the nation a step closer to civil war. If you enter a second-floor courtroom, you'll stand where the Scotts' freedom was finally purchased for them in 1857.